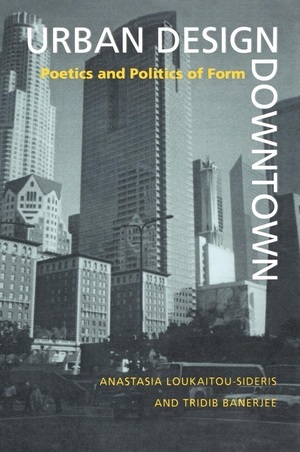 The corporate downtown, with its multitude of social dilemmas and contradictions, is the focus of this well-illustrated volume. How are downtown projects conceived, scripted, produced, packaged, and used, and how has all this changed during the twentieth century? The authors of Urban Design Downtown offer a critical appraisal of the emerging appearance of downtown urban form. They explore both the poetics of design and the politics and economics of development decisions. Following a historical review of the various phases of downtown transformation, Anastasia Loukaitou-Sideris and Tridib Banerjee turn to contemporary American downtowns. They examine the phenomenon of public-space privatization, arguing that corporate open spaces are the consumer-oriented result of policies that have promoted downtown renovation and restructuring but at the same time have neglected the cities' existing poverty-stricken cores. The book's case studies of individual West Coast downtown projects capture the essence of late twentieth-century urbanism. This analysis of downtown urban America, which offers extensive insight into the design and development process, will interest architects, city planners, developers, and urban designers everywhere. Anastasia Loukaitou-Sideris is Associate Professor in the Department of Urban Planning at the School of Public Policy and Social Research, University of California, Riverside. Tridib Banerjee is a Professor at the University ofSouthern California's School of Urban Planning and Development. His most recent book, coedited with Michael Southworth, is City Sense and City Design (1990).